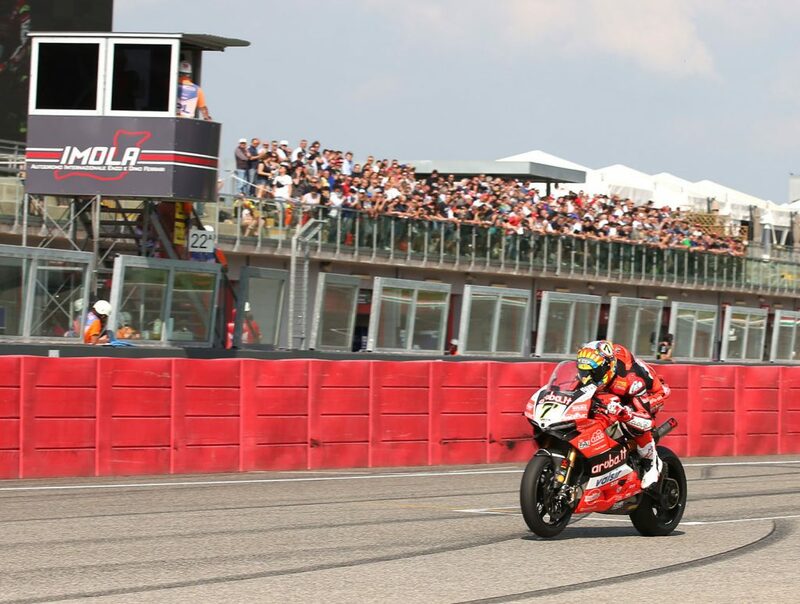 Imola, May 11, 2018 – Imola’s round has once again proved itself to be one of the major events in the Superbike World Championship. On Friday, multitudes of fans flocked to the paddock at the Autodromo Internazionale Enzo e Dino Ferrari di Imola to get a taste of the first competitions on the track. Even with their great expectations, fans were not let down as the SBK drivers gave them a real show starting from the first practice round. As expected, Chaz Davies (Ducati) and Jonathan Rea (Kawasaki) were the fastest on the track, both reaching the finish line in the same time: 1’46”686. The Welshman, four-time winner at Imola, with two double wins in the past two season, showed his deep knowledge of the track, while Kawasaki’s star has shown he has every intention of breaking Davies’ winning streak. Marco Melandri (Ducati), who in the trials at Brno seemed to have resolved the stability issues with his bike, is ready to jump in between the two and join the fight for the top of the podium. The rider from Ravenna was stuck with almost a half second delay, but in the end proved he could still keep up with his main rivals. The amazing day for the Italians was concluded by Lorenzo Savadori (Aprilia) when he managed to leave the likes of the great Michael van der Mark (Yamaha), Tom Sykes (Kawasaki), Xavi Fores (Ducati) in his dust; and by the brilliant tenth place finish by Michael Ruben Rinaldi (Ducati), one of the most interesting young riders. The Supersport World Championship looks Italian this year. Coming in with the best time was Federico Caricasulo (Yamaha), who was able to speed ahead of his teammate and world champion Lucas Mahias taking first by just 51 milliseconds. In third was Sandro Cortese (Yamaha) and completing the four of a kind for the House from Iwata was Jules Cluzel. In the last race of his amazing career, on a track where he has often excelled, Kenan Sofuoglu (Kawasaki) ended the first day with in fifth with another amazing performance, just ahead of the excellent Raffaele De Rosa (MV). Ana Carrasco (Kawasaki) is dreaming of the Supersport 300 World Championships. The Spaniard has proven herself to be a top competitor, race after race, each time coming back stronger. At the end of the two sessions today, she was the only one to break 2’08’’. The top Italian was Bastianelli (Kawasaki) with the third best time, while Sabatucci (Yamaha) made seventh. Finally, in the European Superstock 1000, four Italians were in the top five positions. Federico Sandi (Ducati) is currently holding the pole position ahead of Roberto Tamburini (BMW) and Markus Reiterberger (BMW) all in span of three tenths of a second. They are followed by Riccardo Russo (Kawasaki) and Luca Vitali (Aprilia). Tomorrow don’t miss the Superpole at 10:30am and the start of SBK Race 1 at 1pm. Important guest, Vito Ippolito, President of FIM (Federazione Motociclistica Internazionale) and on Sunday don’t miss the sponsor of the 2018 edition, Aida Yespica.